Where can you find the world’s best Buffalo Wings? You guessed it—Buffalo, New York! Celebrating a 50th anniversary in 2014, Buffalo Wings were invented at the city’s famous Anchor Bar. Buffalo is famous for a lot of things—from the Buffalo Bills professional NFL Football team to the Albright-Knox Art Gallery, to the Buffalo Botanical Gardens, to stunning architecture like Frank Lloyd Wright’s Darwin Martin House and the Tiffany-designed Shea’s Performing Arts Center. But for most people, Buffalo’s most tasteful claim to fame would probably be those spicy, tasty chicken wings. With their fame, Buffalo Wings seem like they&apos;ve been around forever. Truth is, they were invented in 1964 at the Anchor Bar. Dominic Bellissimo asked his mother Teressa to cook something for a group of ravenous friends arriving late at night. Without much on hand, she deep-fried a batch of chicken wings and tossed them in hot sauce, butter, and a few secret ingredients. They were an instant hit. Soon people started coming to the bar for a taste of the wings, and a tradition began. 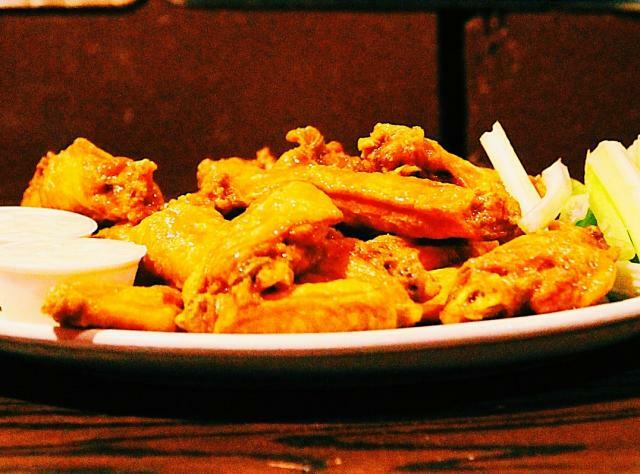 When in Buffalo, drop by the Anchor Bar to try some authentic Buffalo Wings and see where it all happened. Other great wing restaurants serve up their own recipes. Now, you&apos;ll find Buffalo Wings all over the world, but thousands of Anchor Bar fans insist theirs are the best. And with over 80,000 annual guests, Buffalo’s National Buffalo Wing Festival every Labor Day weekend is the world’s most popular celebration of the chicken wing!